"A tax rate among the highest in the state"
COLUMBIA, Mo 2/27/16 (Beat Byte) -- Money Columbia Public Schools keeps in cash and liquid investments has soared 31% in one year, from $125.2 million to $163.8 million (chart). Newly-released financial reports document the increase from June 2014 to June 2015. In 15 years, school district cash and liquid investments have increased 252%, from $65 million in 2001 to the current $163.8 million (Chart below. 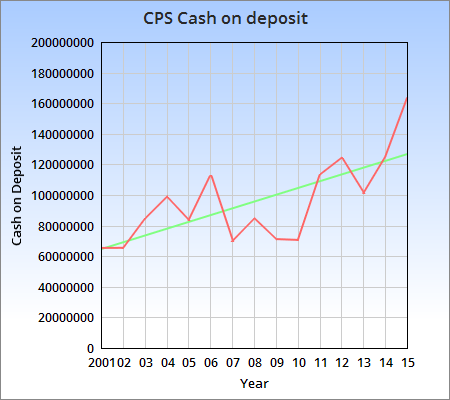 Source: 2000-2015 CPS CAFR). School district officials, meanwhile, are asking voters for one of the largest property tax hikes in Columbia history this April. At the same time, they have told teachers there is "no money" in school district budgets for a 5% wage increase. The 65 cent/$100 of property value tax hike is 11 cents more than a 54 cent hike voters rejected in 2008, prompting the resignation of then-Superintendent Phyllis Chase. The levy increase comes after district officials -- and voters -- approved smaller property tax hikes every year for the past seven years. If voters approve the April tax increase -- which includes more bond debt for land acquisition and school construction, “We will find ourselves at a tax rate among the highest in the state,” Supt. Peter Stiepleman, Ph.D. told the Muleskinners Democratic club last Friday. School Board Members receive a monthly "Treasurer's Report" that documents most of the cash and which banks hold it: UMB, Commerce, Hawthorn, Callaway, Landmark, Bank of Missouri, and others. 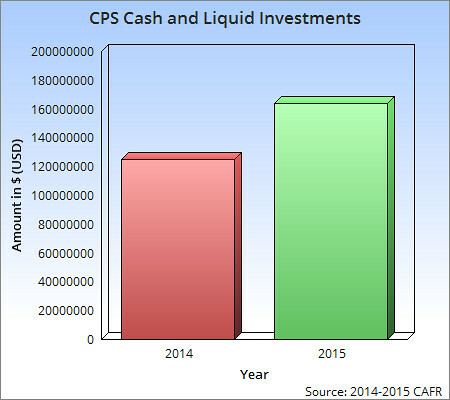 "The Treasurer’s Report shows actual bank balances," CPS Chief Financial Officer Linda Quinley told the Heart Beat. In June 2015, date of the most recent Comprehensive Annual Financial Report (CAFR), banks held $133.4 million, mostly in CDs. Other amounts known as "Debt Service" and "Self Insured" Funds are accounted separately. Quinley broke the figures out (amounts in parentheses are deductions). Until the Heart Beat contacted Quinley, the Treasurer's Report was inaccessible to the public online. Instead, an outdated PDF holding page appeared at the report link. We have since exchanged over 20 emails documenting and clarifying where and in what financial instruments the school district keeps taxpayer monies. Quinley has patiently helped, acknowledging difficulties and the district's complex accounting practices along the way. "Getting the Treasurer’s Report aligned to the CAFR is a challenge," she explained for this story.